Until recently - and by recently we are talking March 4th 1937 when a typed note was fixed to the back of this postcard - this strange sight could be seen near Denver, Colorado. 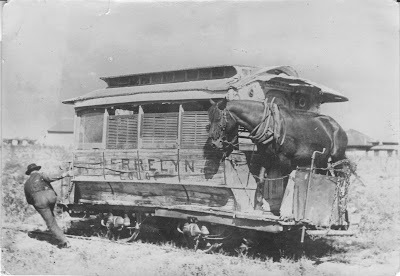 The antiquated Englewood to Cherrelyn tramway rises steeply for its 1 1/2 miles, up which the solitary horse drew the derelict car. The horse was then unhitched, and gladly occupied the rear platform while the car coasted down on the return journey, the driver controlling the brakes as necessary. At the end of its life, the car was run purely as a novelty, and was covered all over with the signatures of tourists.